Summary – Biostrap recently switched over to the Interactive Popups tool and had some pretty awesome results to share. So we compiled a quick Q&A session to see what really moved the needle. 1. Why did you add a popup to your website? Across all our user acquisition channels, we were sending lots of top of funnel traffic during the busiest shopping months of November and December. We added a popup to capture emails on our landing pages to make the most of this traffic. Email is one of the most import acquisition channels for us as we sell a higher priced item so conversion on the first touch point is lower than cheaper eCommerce sites. It usually takes a number of brand interactions to get the conversion. By using email we can reach these people for very little cost instead of paying for ads. 2. What is your website/product about? Biostrap is the most advanced wearable platform. Our clinical-grade pulse oximetry allows deep biometric insights and full-body machine-learning algorithms are able to detect and analyze any repetitive activity that wearers perform. Visit website. 3. How important are emails to your business? What do you use them for? Email capture is an integral part of our user acquisition strategy. We send out emails for sales, blog and product updates. This channel has a lot of benefits when it comes to building a relationship with your leads. Not only is acquiring the email important but the follow-up email drips and broadcasts have a huge impact on sales as well. The more emails we acquire the more we can scale our business. 4. What percentage of your rev/sales comes from sending emails? About 30% of our sales come directly from emails. So optimizing our website for email collection is important and directly related to our revenue. 5. What information are you collecting? Just email. We wanted to limit the information collected to enable higher conversions and reduced friction in user experience. 6. What are you offering your visitors in exchange for their email? We set up the popup in such a way that everyone wins a prize. We have 8 offers on the interactive popup ranging from $10 off to free products. It is important to incentivize and offer something to your visitors as you are asking them for a favor when you show an opt-in form. The market is becoming more competitive so brands need to offer something more engaging than their competitors. 7. Have you tested multiple offers before? If so, what did you test and which offer had the best conversion rate? We haven’t done much testing with multiple offers. But we had an average conversion rate 8% after the switch, which we are very pleased with! 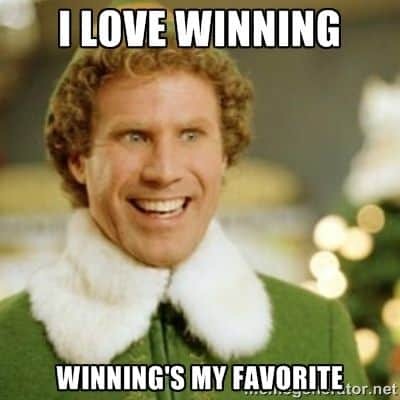 We were able to 4x our conversion rate using gamification and incentivization in out popups! 8. What service were you using prior to VYPER? What results were you getting? We’ve augmented our current services with VYPER’s offering. 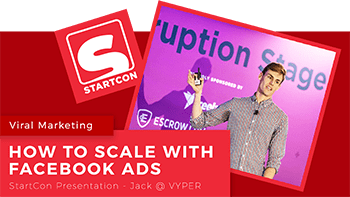 We are using Sumo for several popups, but we have VYPER’s Interactive Popup as our default and prominent email capture on our main landing pages. We were getting a 1-2% popup conversion rate prior to VYPER. 9. After swapping to VYPER, what was the change? After switching to VYPER for our primary means of email acquisition, we were able to 4x our popup conversion rate! We were able to capture around 25,000 emails in the span of less than 2 months. So you can see how improving your website popup can have a huge impact on the overall business and revenue. 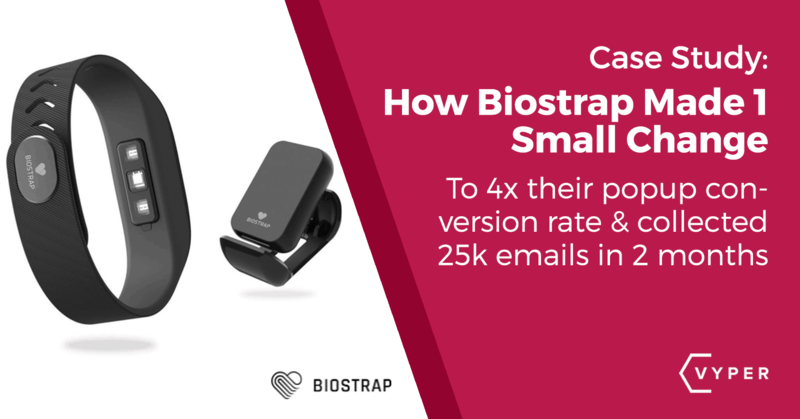 Biostrap was able to take their conversion rate from 1.5% to 8% by changing over to Interactive Popups. If they had stayed with their old popup they would have only collected 6,250 emails instead of 25,000. This can make a huge difference in your bottom line if you are monetizing your email list. Not to mention all the added sales that were driven by people winning coupon codes. You do not have to be using VYPER to achieve these benefits and results (although it definitely helps), here are some easy popup optimization adjustments you can make to your website!